I don’t speak French. I want to speak French and I also want to work on my Spanish. So in the event you read the title of this post and said, “Oh French!” Let it be known the only French I speak regularly are cuss words…in English. At the end of 2017 I decided I wanted to add in a few pieces of just me into this blog. In 2017 the “just me” was my Friday posts and the occassional random thoughts post. It seemed that everything else was fell into health, food, or something seasonal. I love writing those posts but as I started formulating first quarter 2018 I wanted to change things up. This week you will find my participation in two link ups (TBB on Monday and of course the regular Friday deal) but you will also find a revised Healthy Girl (Tuesday) and this post today. So what is this post? Just a girl (me) sharing just some little joy that she could have easily not given a second thought to. Things that happened this week that brought me plain out joy. Not materialistic happiness, not a one up attitude, just straight unadulterated joy. And why am I sharing this? Because the word of the year I have chosen for myself is EXCITEMENT and when you are looking for true EXCITEMENT I believe you should first look for the little-morsels-of-generally-over-looked joy. When you can see a situation, moment, or event as a gift you may never receive again then you have a real reason to be excited. Why? Because you will become more aware of these little surprises and that will lead you to experiencing more excitement as you take notice of the little things that happen over the course of seven days that left you with a feeling of true joy that may have lasted you five seconds or five hours. 2018 began I like New Years (too bad it’s in the winter!) We started it healthy, happy, with new friends! I declared excitement as my word and what I would look for and act with for this year. My husband showed up to Chuck E Cheese and you are confused. The kids’ last day of winter break was Tuesday and I had begged my husband to widdle out some time for the kids. He had to work twelve hour shifts all through their Christmas break. On Tuesday he was off but he was covered in hives and had to go to the doctor. Me being filled to the brim with mama stress loaded the kids up and took them to the dreaded rat pizza game place. Out of nowhere (and twenty minutes after we got there) my husband walked in. Sure he looked like he needed epinephrine STAT but he was there and the kids were so thrilled. My son was surprised with new books in his book bag on Wednesday when he went back to preschool. My mom had ordered him some books before Christmas but they didn’t come until after. He was so thrilled to have these new books. When we got home from preschool I made a cup of coffee and he had a cup of hot cocoa and we snuggled up under a quilt on the couch and read his new books. If you have not read a new book to a little child when they are so immersed in the story then you are missing out. Does this bring back a memory or two? Seeing an interaction between my daughter and one of her friends was priceless. My daughter has hit the age where she’s starting to notice boys in that way other than them having cooties. I caught on that she “liked” one of these boys in that sweet and innocent way of “first crush” style. On Friday at drop off she got out of my car and the little guy got out two cars ahead. The each turned to where they saw each other and it was a true Wonder Years Winnie & Kevin moment. They just stopped for a nano second and looked at each other and started smiling then walked into the school together. It left me smiling all day because it was just too sweet. Date night because both kids had overnight dates with friends and family. I thought it would be dinner and a movie with the husband but he took it to another level and invited friends to go with us to my favorite restaurant on Fourth Street. We had so much laughing, learning, and chatting it up. New friends are such a treasure and one of the best parts of a new friendship is sharing all your stories (silly are the best). I love to find out how people met and their story was precious! Watching someone who thought they could not get over their fear and achieve it I’m talking about my daughter. She picked basketball for this year as her sport. She was all about it and then she decided she couldn’t and she wouldn’t. I’m not a parent that finds it OK to allow a kid to quit anything that is fundamentally good for them. After a practice that included a few meltdowns and then driving her first game on Saturday with her in tears in the backseat I decided sometimes the best thing is to walk away. We got to the game and I told her to go to the bathroom and wash her face then find her team. My husband and I went into the gym and watched the end of the game before ours. He kept asking if he should go check on her and I kept telling him no. (Aren’t I the heartless mother of a biscuit eater.) When it came time for her team to come out and play the Team Mom informed me that my kid didn’t want to play so she would be sitting on the bench. I said that was fine. Then in the second period who was on the court? My kid. She ended up playing half the game. And she was smiling the whole time. Josh this makes me laugh – my son (who is five) now calls everyone (including me) Josh. We’re all just a bunch of Joshes. I have no clue where this came from but it makes us laugh every time. Oh and to play back I call him Tina. So now I’m wondering about you…. What has brought you just plain and simple joy this week or weekend? What made you giggle, made your heart melt, made you realize you are pretty blessed? Comment, please! Or go check out the corresponding post on CCK’s Facebook and put it there. Let’s get a positive and joyful conversation going! 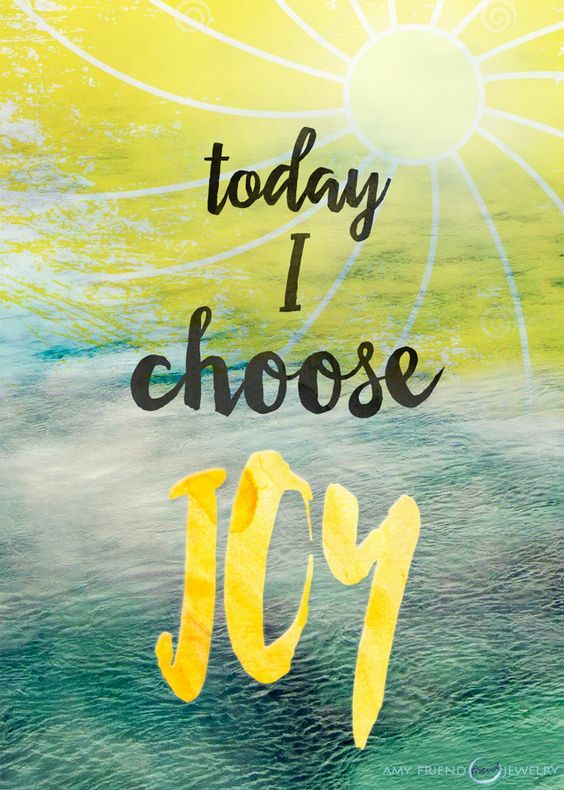 Yes, to JOY! I think it was my word of the year for 2015 and it looks like you had some great JOYful moments last week! Seeing your kids tackle a fear and succeed is amazing!